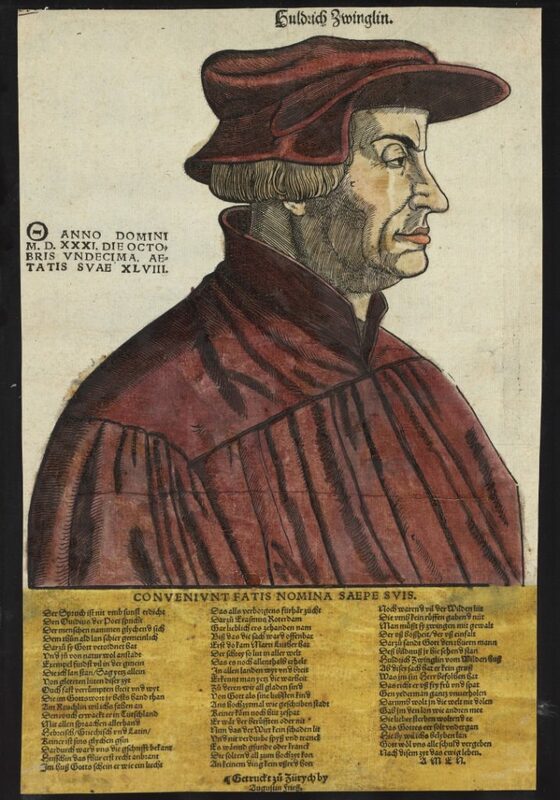 This portrait of Ulrich Zwingli in profile, probably by Rudolf Wyssenbach, was modelled after Hans Asper’s well-known depiction of 1531/1532. Rudolf Wyssenbach’s early works date from the year 1546 and therefore the portrait is dated around 1545/1546. However, as the identity of the artist is not unequivocal and as the German text printed beneath the woodcut seems to be from 1539, the broadsheet may have been printed as early as 1539 when Augustin Friess first opened his printing business in Zürich. Contrary to the claim made in the text, the Latin pentameter (Conveniunt fatis nomina saepe suis) preceding the German verse, cannot be identified in Ovid, but in actual fact derives from a medieval poem. The Latin motto is borne out through the text and the individual names symbolize the protagonists’ actions. Johannes Reuchlin did indeed ignite the first smoke (rouch) in Germany and was succeeded by Johannes Oekolampad (Husschin) who then kindled the fire properly and shone (schein) as a light in the house (huß) of God. Furthermore, Erasmus of Rotterdam launched the gospel very pleasantly (lieblich), before Martin Luther proclaimed it loudly (lud) into all the world. The savage people (wilden lüt) resisted change and had to be forced (zwingen), hence God sent Ulrich Zwingli from Wildhausen. Zwingli is glorified as the vanquisher of the corrupt church and the reformer of the true church. These verses are ascribed to Leo Jud, pastor in Zürich and Ulrich Zwingli’s most important fellow reformer. Jud was also the editor of the first identifiable print by Augustine Fries, the „Imitatio Christi“ (Nachvolgung Christi). The verses of this woodcut were translated into Latin at the end of 1539 by Andreas Zebedäus, pastor in Orbe, Kanton Vaud.